Stadionul Marin Anastasovici is a multi-functional football stadium located in the southern Romania city of Giurgiu within Greater Wallachia. 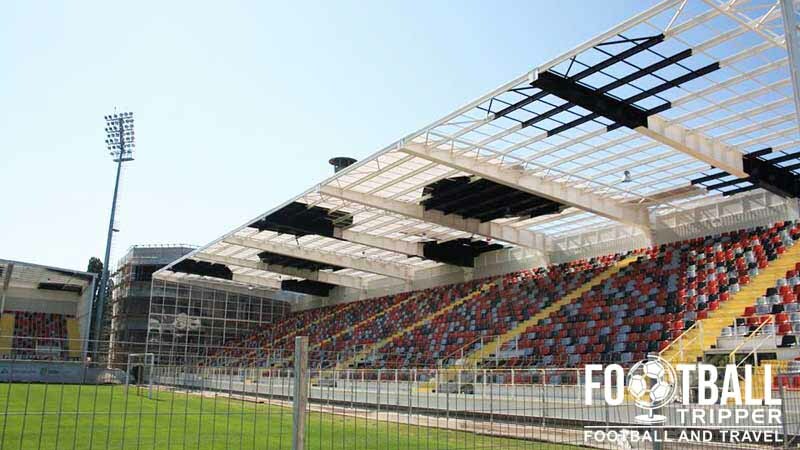 Home to local team FC Astra Giurgiu since 1963, the 8,5000 capacity ground is now all-seater after a series of renovations between 2012 and 2014. The origin of Marin Anastasovici stadium dates back to the mid 20th century when it was used as the home ground of FC Dunărea Giurgiu who were founded in 1963. Purchased by Romanian entrepreneur Ioan Niculae in 2010, the club were effectively dissolved in 2012 after the businessman relocated FC Astra to the city of Giurgiu and made them permanent residents of Stadionul Marin Anastasovici. With FC Astra having previously played in the city of Ploiești for 91 years, they were formally known as Astra Ploieșt until September 2012 when they became FC Astra II – FC Astra Giurgiu. Departing their former Astra Stradium with a 1 nil victory over the famous Dinamo București, the club moved into their new home a few weeks later on the 23rd of September where they defeated Gaz Metan Mediaș 4 nil to continue their excellent start to the 2012/2013 season. With FC Astra now settled into the Stadionul Marin Anastasovici, the club managed to attain an impressive fourth place finished, achieving entry to the Europa League for the first time in the club’s history. The following season turned out to be even more successful for the club, with the team recording 2nd place behind Steaua București – a team FC Astra would later defeat in the final of the Romanian Cup a few weeks after. After failing to qualify for the group stages of the Europa League during club’s first attempt, Astra regrouped and in their second attempt the season after they managed to claim a major European scalp. The Romanian side managed to defeat Olympique Lyon 3-2 in the third qualifying round, and progress to the group stages where they faced Red Bull Salzburg, Glasgow Celtic and Dinamo Zagreb. 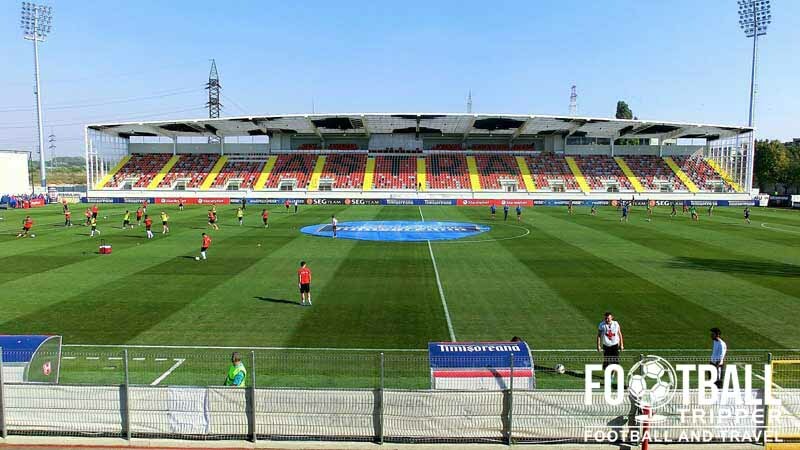 If Astra continue to challenge for the Romanian title and repeatedly feature in European football, expect the billionaire owner to expand the ground’s current 8,500 capacity. Stadionul Marin Anastasovici is comprised of Three stands: East (Orange), South (Red) and West (Blue). FC Astra were founded in 1921 in the city of Ploiești but moved to Giurgiu in September 2012 by the club’s owner Ioan Niculae with the team’s official name changing to reflect this. The newly formed FC Astra Giurgiu secured Europa League football for the first time in both club’s history during the 2012/2013 season after an impressive 4th placed finish. For the 3rd Round qualifier for the 2015/2016 season they will play West Ham United, after defeating another British side, Inverness CT from Scotland 1-nil on aggregate. 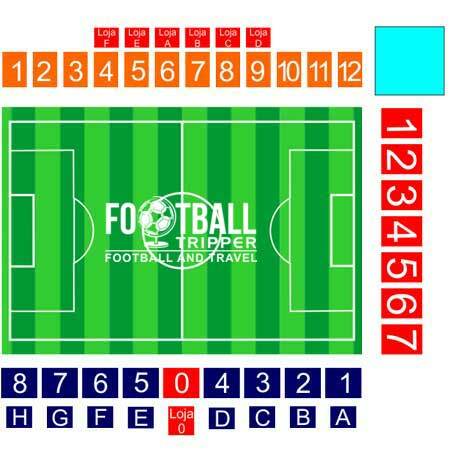 When Celtic visited during the 2014/2015 season the club were given an allocation of 600 tickets, and were housed within sections 7 and 8 within Tribuna 2. Identifiable on the seating plan through the colour blue, the section of seating sits within the north-west corner of the stadium, and appears to be accessible via Strada Unirii. The views from the stands are unfortunately hampered via a large wire fence which forms a cage around the travelling supporters. The Facilities are also basic with toilets provided via temporary installations. There’s not too much in the way of pubs or places to drink within Giurgiu – at least according to Google Maps. It will probably be a case of seeing what you can find, with the compact size of the city making this relatively straightforward. The map below shows two places that you should be able to get a beer from. AFC Astra Giurgiu are working on building a new club shop in time for the 2015/2016 season. 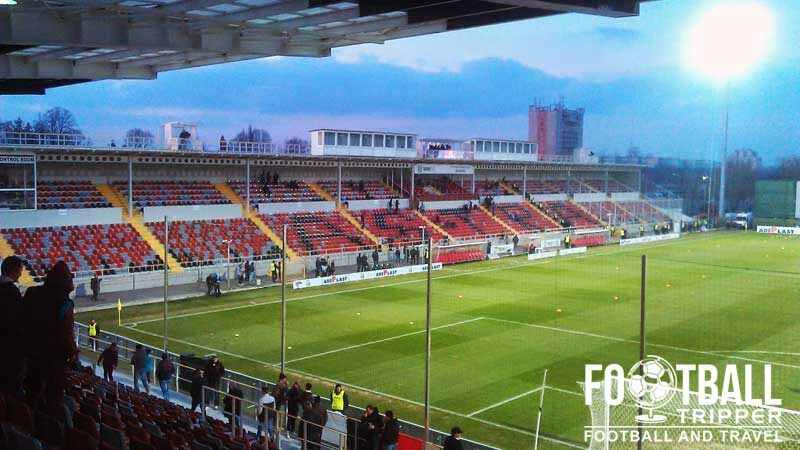 It doesn’t appear as if Astra Giurgiu currently offer a stadium tour of the facilities at Stadionul Marin Anastasovici. If this changes we’ll undoubtedly update this section. Tickets can be purchased at the ticket office before the match or online from eventbook.ro. 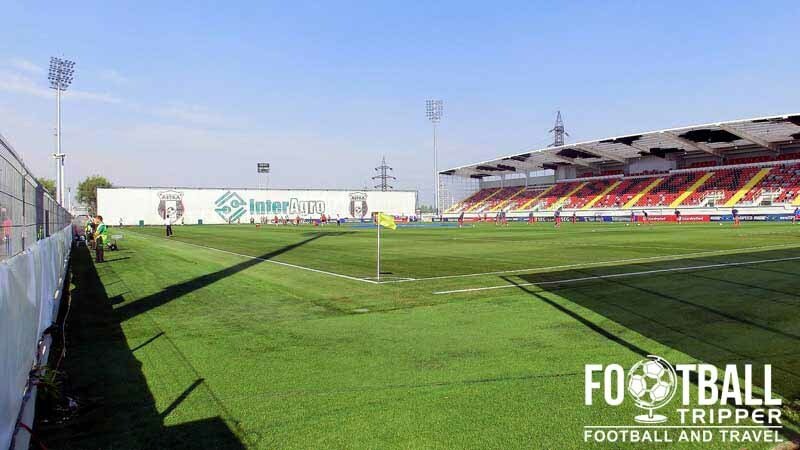 Marin Anastasovici stadium sits 2.1 km east of Giurgiu’s main city centre which means that you can easily walk to the ground in well under 30 minutes. Giurgiu railway station is centrally located within the city, and is well connected to the rest of Romania with direct trains to Bucharest (2 hours +), Gradistea and Videle. AFC Astra’s ground lacks parking facilities which means you will have to explore the local area. Around the stadium there is mainly agricultural land to the east, residential streets to the west which means you may have to park in the city centre. The city has a relatively underdeveloped public transport network which means that the stadium lacks its own bus station or bus routes. Stick to walking, or if you prefer a taxi. A peak through the corner of Stadion Marin Anastasovici from the south-west corner. The city lacks its own airport which means that Bucharest Otopeni Airport is the most convenient flight hub to use. Upon landing you could either take the train from Bucharest North Station to Giurgiu or catch a bus service from Piața Eroii Revoluției. The closest place to stay in relation to Stadionil Marin Anastasovici is the Hotel Steaua Dunării which is less than five minutes north of the ground on Strada Unirii. Requiring a taxi there is the highly-rated Hotel Sud and the three star Hotel Sunny, with the cluster of Hotels south of the River Danube including the Danube Plaza Hotel in Bulgaria also an option.